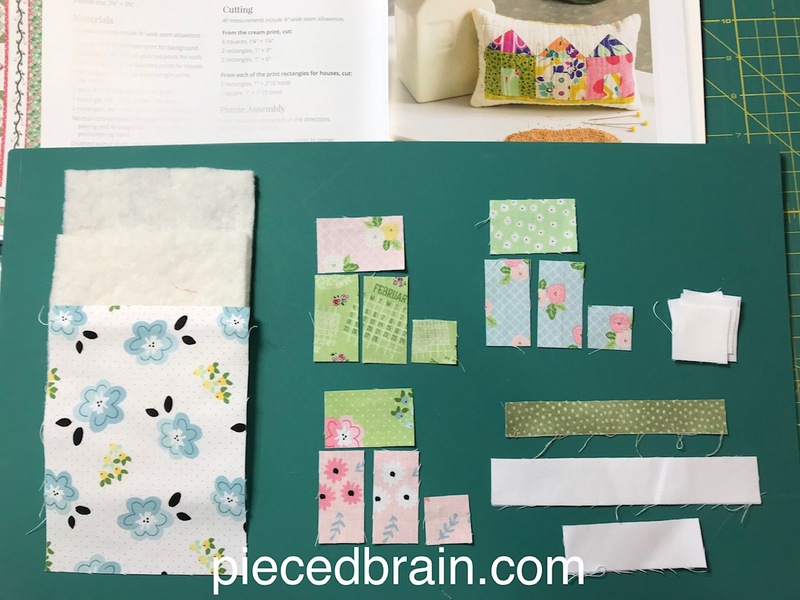 Pieced Brain: Best Pinnies Ever! Look at it! 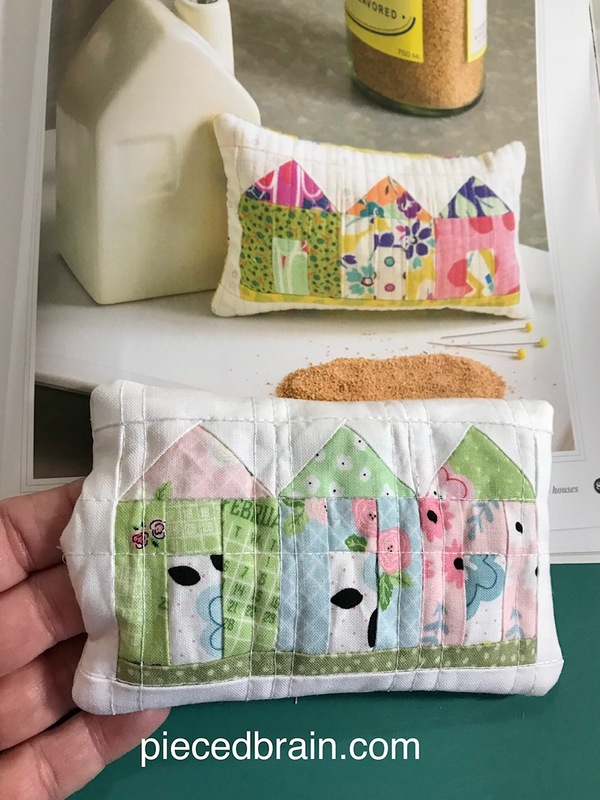 Last night I dropped everything and locked myself in my studio to make these pincushions - I could not help it after I saw them! In no time at all, I found the fabrics I needed in my stash (that is THE reason we have such large fabric stashes - on a whim we can open those magic drawers and quickly choose the best fabrics for the project we MUST make now!). These are all by Riley Blake Designs - I am totally smitten by their Date Night collection! 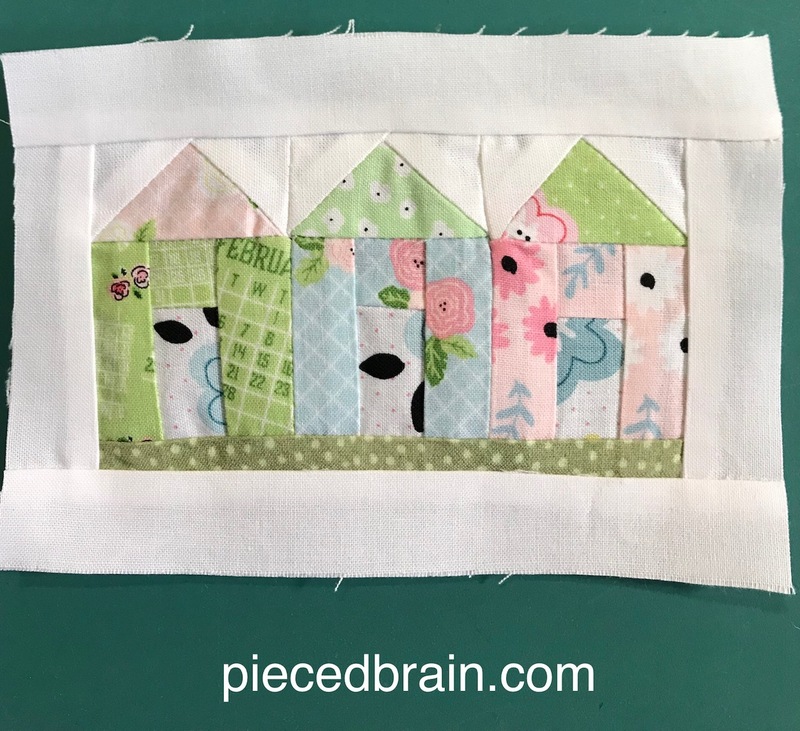 From tiny pieces of fabrics, a neighborhood emerged very quickly. 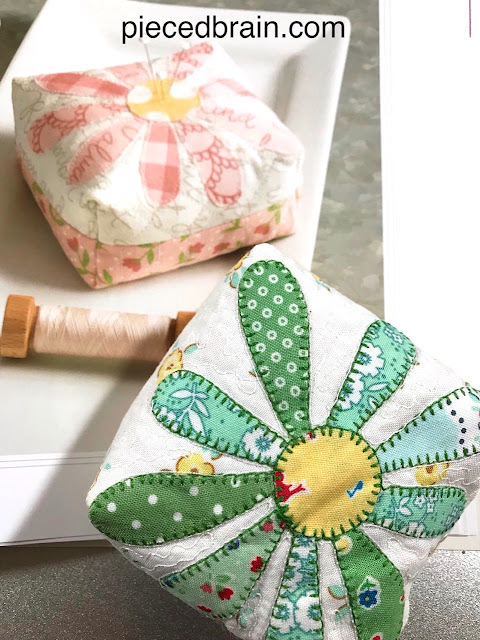 You know I am moving in a few weeks so this pincushion caught my eye for its cuteness and timely design. 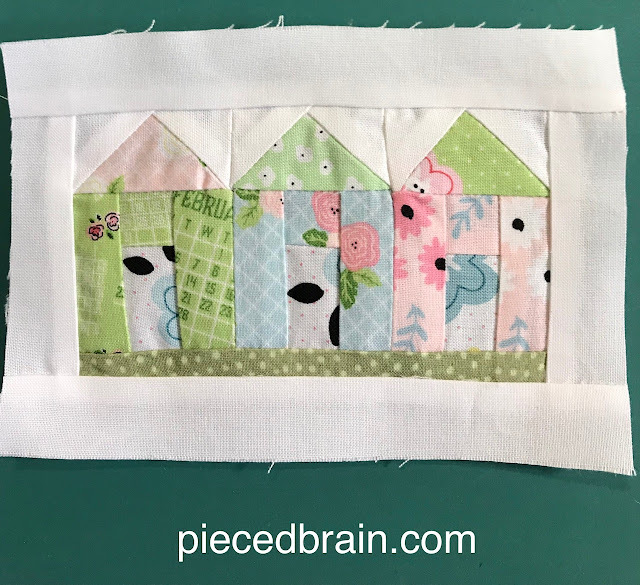 Here it is with simple quilting and ready to be filled. 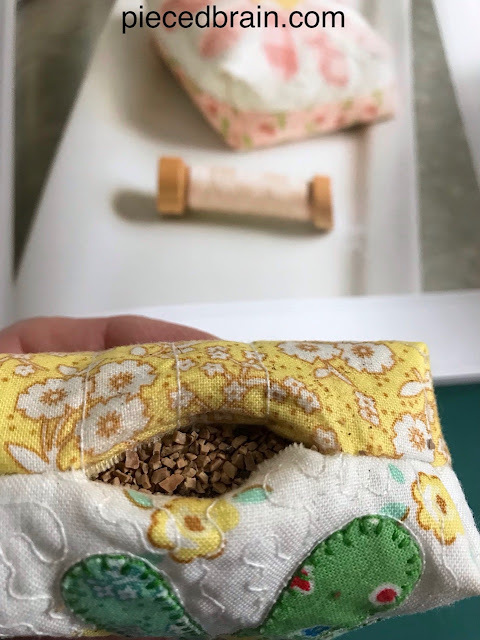 Crushed Walnut shells is an indispensable item in a quilter's studio. I left a big enough opening for the spoon to fit inside. The flash from the camera is hitting the small aluminum pan serving as a base for my 'operation'. It is perfect to catch the little pieces of filling, and then I can just pour them back into the plastic bag. 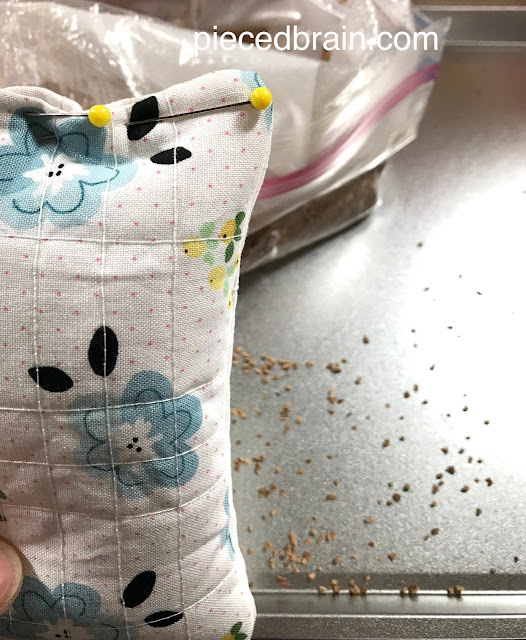 I pinned the opening and slip stitched it shut. Ta-da! But, hey, I did not stop there. These are so addictive! 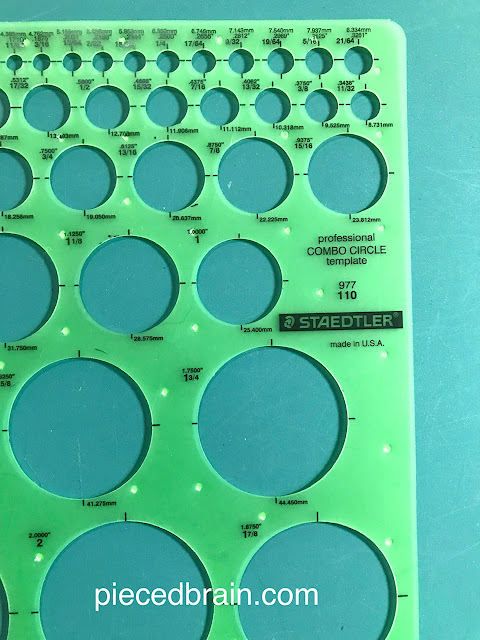 ... and before I go on, this is what I use to draw perfect circles. I have had it for years. Ah... I needed some green energy vibes and so I made a green flower. My machine will go to the shop while I am in my 'Pack the House' party because the tension needs adjusting. But, you can see the blanket stitch I used is still turning out fabulous. 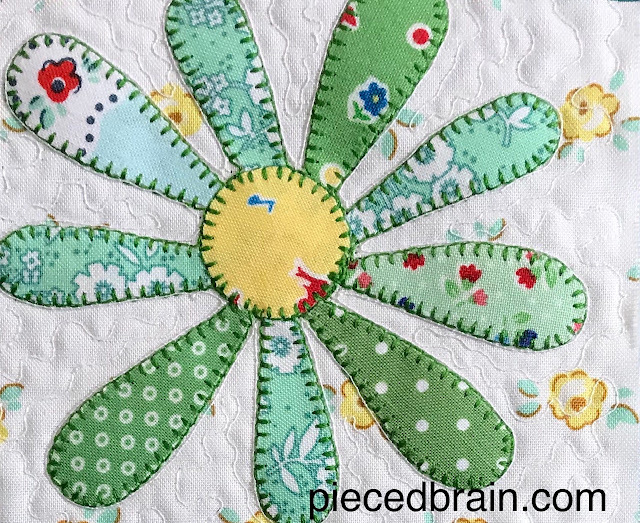 I use 40 wt thread for the machine applique'. Always. Well, unless I do not have the color I need. 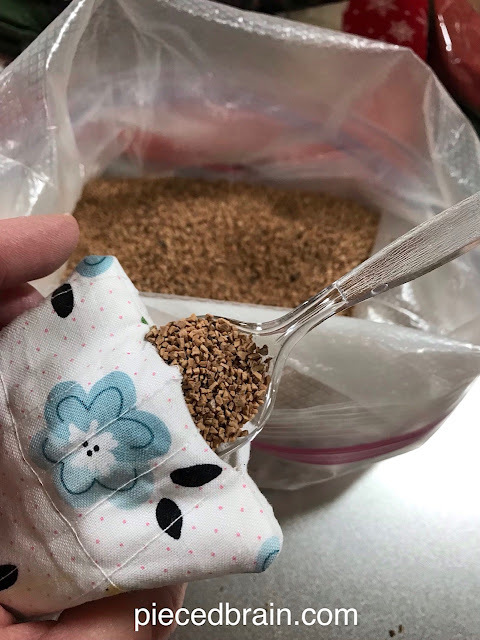 I filled it to the very tippity-top with crushed walnut shells again. And here it is, my boxy pincushion. The one on the background is from the book. 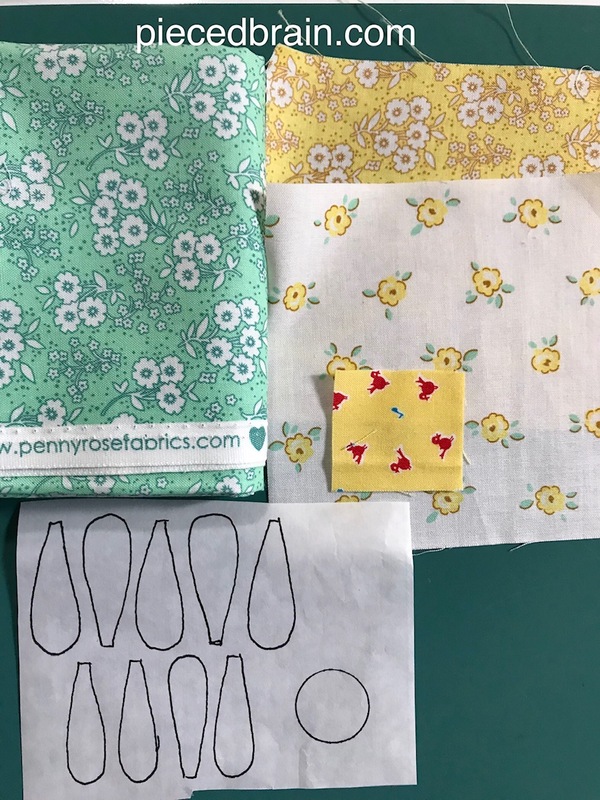 Oh, yes, I need to tell you where I found these gorgeous patterns! They are from Carrie Nelson's latest book "Pin Pals" published by Martingale. That I made these two pincushions in under, way under 2 hours tells you the instructions leave no room for doubt. 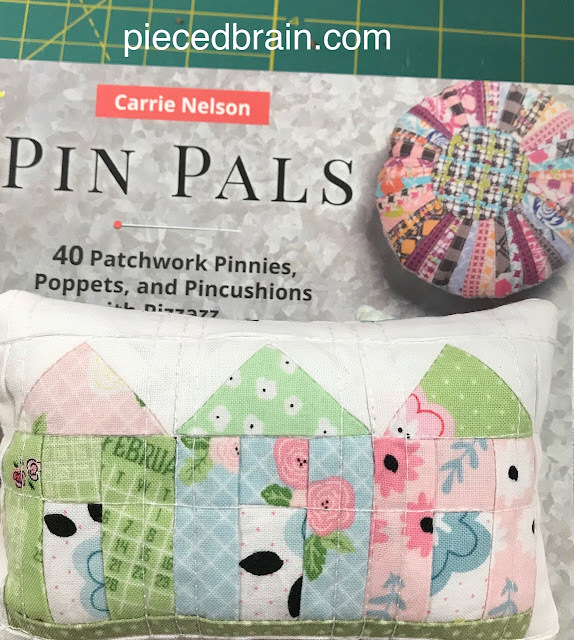 Carrie's pincushions and pinnies are so fun! Can you tell I had a blast last night? 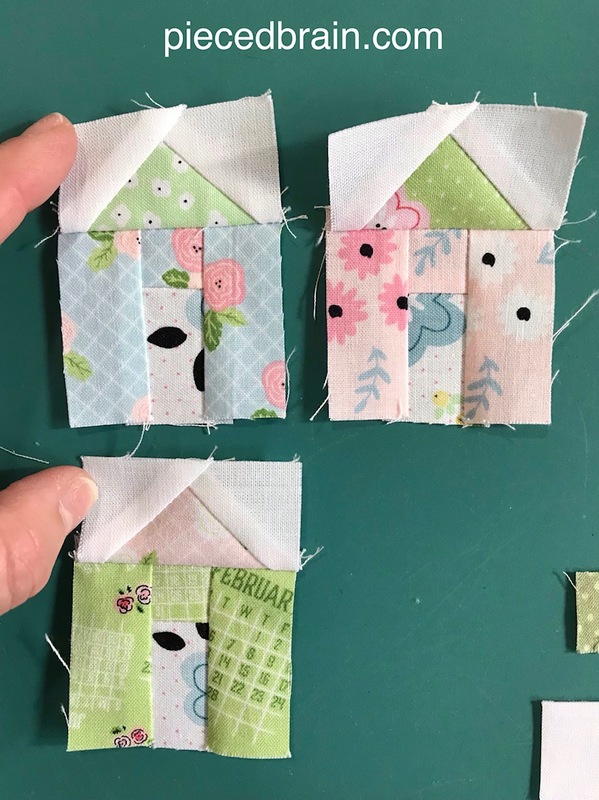 They are unique and make perfect gifts for your quilty friends. They can also add a touch of whimsy to your home decor if you casually place them near your craft chair, on the coffee table atop your favorite books, or on the nightstand to remind you every morning of the one thing you need to find time for every day - quilting! And so it is. 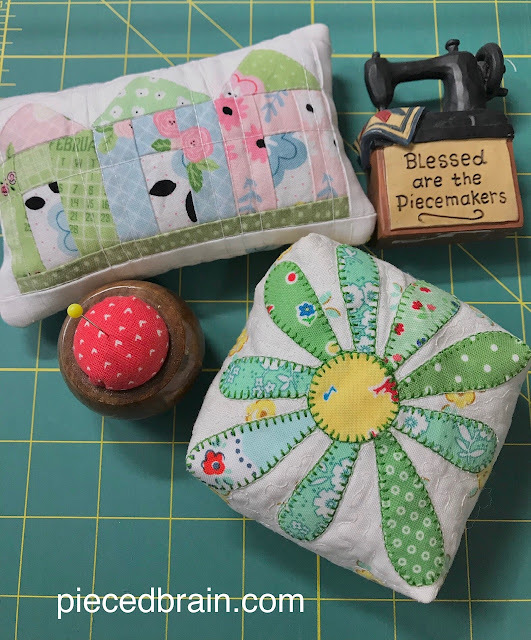 I am a happy camper because I found time to delight my 'maker' soul by bringing to life these pincushions. Do you think Carrie was thinking of me when she designed these? I can dream, can't I? Right? The book's designs are so beautiful! They are just too cute! 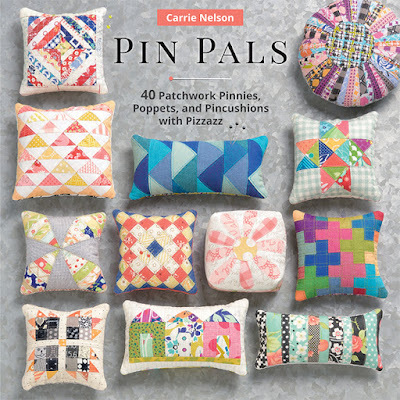 I bought this book, but have not sewn a pinnie yet. Need to get on it! Oh... it can be tough to decide which one to make first!